Also known as the eastern redbud, the American redbud is a fast-growing small tree. The violet-pink buds and rosy-purple flowers are among the first blossoms to don tree branches in the woodlands of eastern North America in early spring. It is a popular ornamental tree for residential yards as it casts welcome shade onto lawns, too. The botanical name for the American redbud is Cercis canadensis, and it is a member of the pea family, Fabaceae. Some taxonomists consider both the Texas redbud (Cercis canadensis var. texensis) and the Mexican redbud (Cercis canadensis var. mexicana) natural localized variations of the American redbud. Another species that is native to the United States is the western or California redbud (Cercis occidentalis). American redbud is found across a large expanse of southeastern North America. In Canada it exists in the woodlands of the extreme southernmost tip of Ontario. In the U.S., the tree's range extends from New Jersey westward to Nebraska and south to Texas and northern Florida. Two separate populations are found in central Texas and in northeastern Mexico. Forming a rounded canopy with tiered branches, American redbud has smooth gray-brown bark covering its multiply trunks. It grows 20 to 30 feet tall and wide. The leaves are heart-shaped and slightly bluish light green in color, becoming golden yellow in autumn before they drop away. Before these leaves emerge in early spring, clusters of purplish-pink flower buds appear on the bare branches, opening to rosy pink pea-like blossoms. Once pollinated by bees, the flowers become flat, brown pods that split open later in autumn and winter. 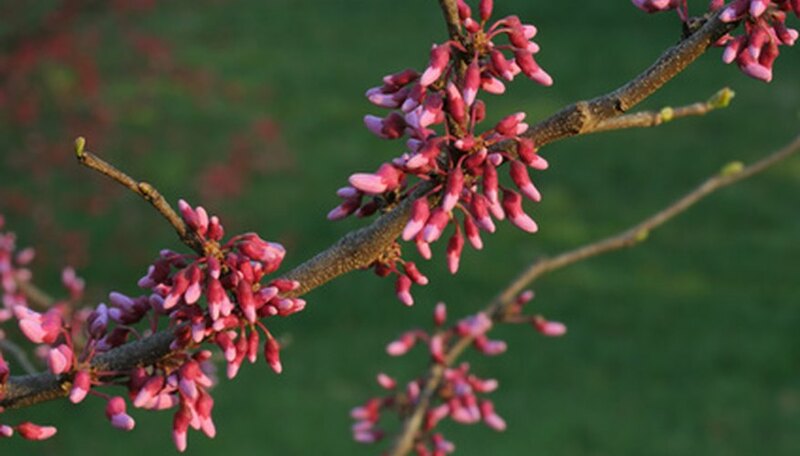 Plant a redbud tree in a deep, fertile loam that is moist and well-draining for finest growth. This tree tolerates denser clay and porous sandy soils, too, as long as moisture is even. It adapts to acidic and highly alkaline soils well. Provide at least 4 hours of direct sun daily, regarded as partial shade, to over 10 hours of sun, considered a full sun exposure. It grows successfully in USDA Hardiness Zones 4 through 9, and possibly in the warmest parts of Zone 3 if grown in a sheltered location out of cold winds. Horticulturists have selected various seedlings of the American redbud for exceptional ornamental characteristics. White-flowering varieties include 'Alba' and 'Royal White', while 'Forest Pansy' has purple foliage. The Texas redbud variety 'Oklahoma' is regarded for its deep magenta-pink flowers and better tolerance for the heat, dry soils and humidity of the American South. If the American redbud grows in a highly stressful environment, such as extended drought, flood submersion, or overly hot conditions, it declines. Its susceptibility to disease also increases, particularly from canker and verticillium wilt.